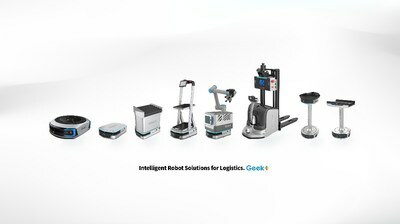 BEIJING, Feb. 12, 2019 /PRNewswire/ -- AI & Robotics company, Geek+ announced it will release the world's first interweaving Robot Sorting System with the latest version of Geek Picking System at LogiMAT 2019, the international trade fair for intralogistics solutions, to be held in Stuttgart, Germany from February 19 to 21. Geek+ is a leading AI-driven robotic solution and service provider - and China's No. 1 supplier of warehousing and logistics robotics. Now, it is bringing its award-winning solutions "Geek Sorting System" to Stuttgart for LogiMAT. Its wide range of automated and intelligent devices is capable of handling the material (pallets/boxes/single pieces), from goods receipt, unloading and storage, to picking, packing and order shipment. Geek Sorting Robot S20 is an innovative and productive tool to increase parcel sorting efficiency in distribution centers. Unlike traditional cross-belt sorters, this sorting system is designed to be highly flexible and easy-to-use. Warehouse reconstruction or two-layer steel platform structure is no longer necessary, so time and cost are saved. The P800 picking robot is equipped with QR code navigation and multiple-sensors. It can follow ground markings and pinpoint the right rack accurately. Managed by a powerful Geek Picking System that integrates strong algorithms, big data analysis, and a series of optimization strategies, hundreds of units are able to operate simultaneously. With the deployment of Geek Picking System, fast improvement on warehouse operation efficiency and order fulfillment accuracy have been proved by many testimonials. Founded in 2015, Geek+ has successfully delivered over 7,000 warehousing and sorting robots worldwide to more than 100 clients from different industries, including e-commerce, retail, 3PL, manufacturing, and others. Many well-known enterprises have benefited from implementation of Geek+ robots with significant productivity improvement and labor cost saving. "Even though it's the first time that Geek+ is exhibiting at LogiMAT, we've already started partnership with some outstanding customers and have accomplished several projects in the UK, Poland, Spain and other countries. We would like to take the opportunity to showcase our cutting-edge robotic logistics solution and expect to help more European companies to achieve robotic automation so as to reduce warehousing operation cost," said Yong Zheng, CEO of Geek+. "Moreover, I'm glad to say that our German branch is prepared to open soon. Then, we will be able to offer more efficient support and service for our European partners." The Geek+ executive and sales teams will be presenting audiences a thorough introduction to their turnkey intralogistics solution. Visit them at booth Hall 7 C51. Geek+ is well-funded (it has raised $150 million in Series B), has 600+ employees, and provides one-stop AI and robotic solutions to enhance efficiency for users in warehouse management. Geek+ attempts to simplify steps in order fulfillment, material handling, and sorting using AI and robotics to reduce labor, optimize parcel consolidation and the picking process, and manage fleets of robots.